This watch is gorgeous! Definitely exceeded my expectations. The only downside to it is that it is rather large, and most people will have to remove some chains to make it fit their wrist, and that is a bit difficult. This stunning women's watch from August Steiner is perfect for a night out. 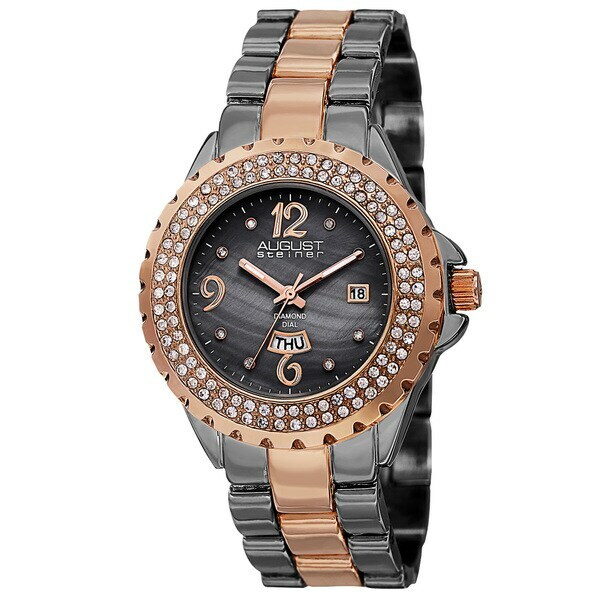 It boasts a beautiful mother of pearl dial and genuine diamond markers, with crystals on the bezel. You can't go wrong with the Japanese quartz movement and day and date display. Yes, I would truly recommend this watch. It has everything you should need. Time, date and day. It's also gorgeous. It goes well with my wedding rings. It shines like new money. I love it. This is my dress up- go to watch. I was not found of this watch. The quality was not good and its heavy in weight. The stones were dull which makes the watch appear unattractive. Having to send back. My wrist are by no means big or small. I could have got it seemed like this band around both wrist and it would have still been to big.Beautiful watch. I love this watch and wear it every day. People are always commenting on it too. Love this watch! I get complements on it every day. Great price! Everything I expected and more it needed some links removed and that was easy.